Tesco.com Innovation Day, London, August 2009. So we're having an Innovation Day! We're doing this because we really want to create a step-change for the better in the customer experience of Tesco.com's online services, and we also want the people who help us implement that step-change to also share in our success. We're planning to host the day at a conference centre very close to Victoria station in central London, pencilled in for Wednesday 5th August 2009 (a date not locked down yet). The 'creative' segment will take part in the afternoon, which will have a great mix of Tesco.com customers. Together they will be encouraged to come up with all manner of exciting ideas that would transform their own experience when shopping online with Tesco.com (by whatever means). This can be anything from an up-rated web look-and-feel through to working on devices from mobile phones to games consoles and more. The deliverable of this segment will be a series of white boards and other materials that represent those various ideas, and we say goodbye to these invitees (with a nice 'thank you' goodie-bag). We'll then sift through the most interesting, promising, and popular ideas. Then the evening comes and the 'technical' segment begins. The invitees this time are IT developers and creative types who will be able take on these ideas and understand how they can use the Tesco.com API to create applications that satisfy those ideas. The developers can be anyone from enthusiastic individuals through to software development houses, but they all share one goal - to build an application so good that they make money from customers using it. The way thay can gain income is because, as long as their finished application meets an essential set of quality and support thresholds, they will gain a rare access to our affiliates network which pays for every new customer that joins Tesco.com and starts ordering through their application. That's not just the 'winning idea', but every idea that passes our threshold. We'll make the evening a fun geek-fest complete with pizza and more, and I'll be inviting a mix of all kinds of developers who can code websites, flash/silverlight apps, mobile phones, or set-top boxes, or whatever! Now we're still in the early days of 'designing' this event, but excitement has carried right through to the main board of Tesco - and you can expect at least one senior director to be present at the event. As time passes I'll put some more details here on this blog. In the meantime if you think you would like to be part of the event - whether a customer of Tesco.com, a creative individual who can visualise something new, or a teccie who would like to rustle up an application, then keep monitoring this blog. From late-June you'll be able to apply for an invitation through a web site, bearing in mind that places will be limited. We're looking to invite 150 in the afternoon and 150 in the evening. So that's it for now: a Tesco.com Innovation Day where we invite customers, creatives and developers to take part in achieving a 'step-change' in the customer experience, pencilled in for Wednesday 5th August at a conference centre close to Victoria station in London. Tesco.com grocery is presented on our web site using a list-based format. For example, you type in 'baked beans' and you get a list of baked-bean products. The list-based format is all well and good because it performs well, allowing quick access to products and customers understand it. Unfortunately it has one drawback - it just isn't very exciting. Indeed I have often referred to our grocery product listings as a bit like a quartermaster's store. It's just "pages of stuff we have in stock". And - let's be clear - we've done this deliberately. Most of our grocery product range listing doesn't need to be exciting - it needs to be fast and functional. Customers tend to order around 5o different product items in a single shop, so woe betide us that we pretty the web up and find it annoys customers by slowing their shopping experience down. However some aspects of our product range should be exciting but just aren't exciting thanks to our list-based system. Think about the emotional contexts of beauty products - brands such a L'Oreal, Pantene, Radox, Olay and others. These brands create products that involve the emotions: inspiring, relaxing, washing, bathing, rejuvenating, making us feel cleaner and look younger. Shoving them into a list like we do baked beans hardly does them justice! From what I've told you so far, it's not a surprise to learn that we sometimes under-sell beauty brands online compared to in-store shopping. The in-store merchanding teams have done a sensational job with the look of the beauty department in Tesco stores, creating the right ambiance to match the beauty brands being displayed. So we've been inspired to do the same. Would you like to take a look at what we're prototyping? Imagine that you've arrived in the 'beauty' area of our website - either by navigating through the department - aisle - shelf hierarchy or because you typed a beauty brand into the search box. The first thing you would see is what you get today - a list of products. However imagine that above this list would appear a link to something called 'Beauty Room'. - you will achieve the same end; a new window will open marking the entrance to the 'Beauty Room' application. 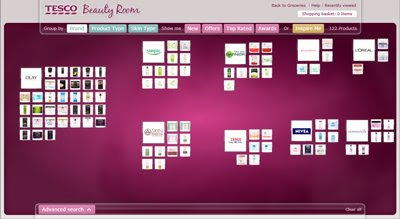 Now 'Beauty Room' is very much a work in progress - work that starts with overcoming the 30 to 60 seconds it takes currently to login using your Tesco.com grocery email and password and download the product range - please be patient!. Just for the benefit of personal data and privacy, your login data is used to call the Tesco.com Grocery API and download the beauty product range. Your details are not stored or logged on the www.techfortesco.com server I use for R&D. Indeed all that server does is serve you the 'Beauty Room' application and a couple of web pages. Serendipity: the effect by which one accidentally discovers something fortunate, especially while looking for something else entirely. Canapé: a small, prepared and usually decorative food, held in the fingers and often eaten in one bite. Often served at conferences and business events during networking conversations. I sometimes attend conference networking events where I can meet with startups and small/medium enterprise (SME) businesses who might give me answers to problems and spawn new ideas. But when I attend these events, the problem for me is always the same: Is the person I am talking to at any one moment the right person to help me? Or could it actually be the woman who has her back to me talking to someone else, or the bloke across the room selecting a canapé from the food table? Sometimes I feel that obtaining success from an event is usually down to random adventure and serendipity - which quite frankly is as un-business and unprofessional as it gets, especially if I am attending on company time. Occasionally I attempt to stack the cards in my favour by playing-up the fact that I am from Tesco, whereupon I might get invited to 'say a few words' which I use to announce why I'm there and what I'm looking for. If you think that's unfair, it's OK; revenge is often swift: the result of my 'words' is often to become surrounded by salesmen with sharp suits, sparkling teeth and eye pupils that became "pound-sign" shaped the moment they heard the word 'Tesco'. And of course they have something to completely solve my problem, and a 33-slide PowerPoint deck to prove it. "Let's match diaries, I'll ping you an invite!" they say. So last night I attended a dinner hosted by the National Endowment for Science, Technology and the Arts (NESTA). Nesta describe themselves as "a unique body with a mission to make the UK more innovative." Nesta add, on their website, that they "invest in early-stage companies, inform and shape policy, and deliver practical programmes that inspire others to solve the big challenges of the future.". NESTA personnel have exactly the same problem (of always finding the right organisation when networking) that I do when they attend such events, and uncovered that many other big brands did too. So they decided to get a group of us "big brands" together who experience that problem to see if we could come up with a more productive way of matching us up with these innovators. By "us" (I was delighted to discover) was a whole host of big brand companies from Virgin to McLaren, from Lastminute.com to the Ministry of Defence. How can we draw start-ups and SMEs to us in confidence who have ideas to embolden our business and/or the skills to fix our problems? How can we score 'bullseye' first time every time, so we don't have to reply on serendipity when looking for the right organisation? How can we provide a 'safe haven' for ideas so that they are protected, giving startups and SMEs the confidence to share those ideas without fear of plagiarism or theft? How can we rate (and be rated on) our experience with these small organisations so that more companies get a greater success rate? Indeed, in certain circumstances could we create a low-cost 'symbiotic' atmosphere helping each other with innovation - without undermining our business by giving stuff away to competitors? The meeting was quite an adventure, and I was surprised and delighted how many of us felt there may be a way forward for Nesta to create an 'innovation club' with members from big brands to startups, and a market to trade in ideas and problem solving. These are tiny steps but Nesta is definitely onto something and I'm happy to lend a hand in its creation. After all, I'm not paid to rely on serendipity and eat canapés.